You’ve been thinking about learning to sew and are ready to get started. You don’t have a sewing machine! To find the best sewing machine for you, it is helpful if you think about several questions before you actually start looking for your future sewing machine. Having thought about these questions ahead of time, and maybe even having answers, will make your shopping experience productive and enjoyable. Think carefully about the following questions before you go shopping. Your hunt for the perfect sewing machine will be more focused and you will be less likely to get overwhelmed by the number of choices. Why do you want a sewing machine? As you start your hunt, you will discover many sewing machines can be used for multiple purposes while other machines are designed for a specific kind of sewing. Some specialty machines are sergers (uses multiple threads to simultaneously sew a seam, trim off the raw edges, and finish the edge), quilting machines (designed specifically for quilting), and embroidery machines (allows you to personalize items with letters, words, and graphics). 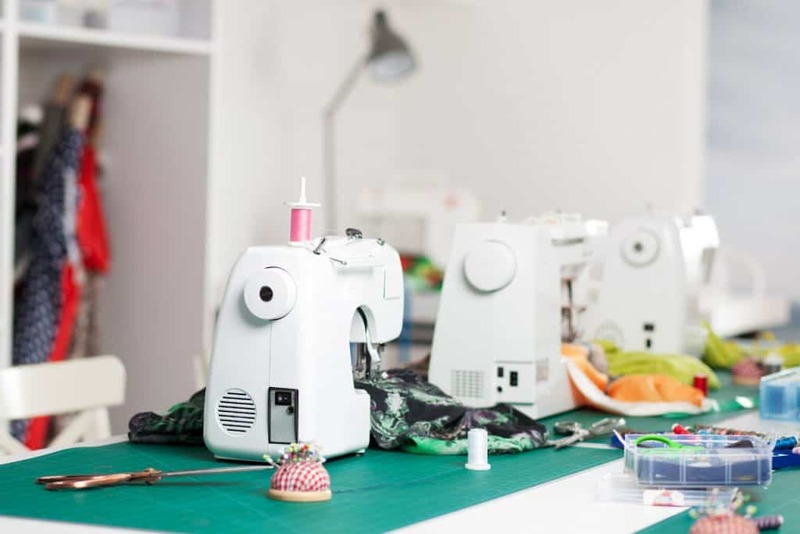 If you have imagined yourself making clothes, doing random sewing and craft projects, home decor, and/or piecing and quilting you will want to look for a traditional sewing machine that will enable you to sew one or more of these types of projects. If this sewing machine will be your first one, you will want to look for one that has fewer features making it easier to use. As you delve into the world of sewing, you will enjoy it so much more if you can spend most of your time learning basic sewing skills to make the things and not on how to work the machine. 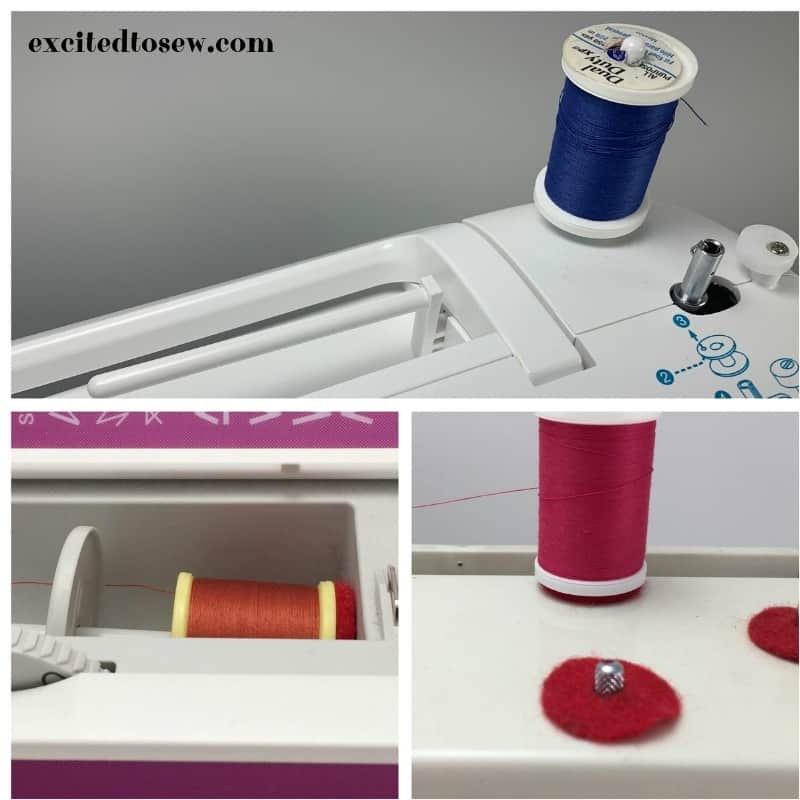 If you have been sewing for a while and are thinking about getting a new machine, look for one with features that will address frustrations you have felt and solve problems you have experienced on your current machine. Do you want a mechanical, electronic, or computerized sewing machine? Note: As you think about how you would answer this question, consider how comfortable you are with technology. Almost all sewing machines made today use electricity to power them. The three types of machines referenced in this question have to do with the way you tell the sewing machine to do certain things, such as, but not limited to, stitch length, stitch width, and selecting the type of stitch you want. Mechanical sewing machines use knobs, dials, and levers to make selections. You have to manually make changes. The number of stitches you can choose from are usually limited but you have all the features you need to start sewing. Electronic sewing machines use buttons and an LCD screen or possibly touchpad controls to tell your machine what to do. Tasks that need to be done manually on a mechanical machine (like threading the needle) may be automated on an electronic machine. These machines will likely have hundreds of stitch choices. Computerized sewing machines may have automated features like the electronic sewing machines but will likely have removable memory cards, and/or can be attached to the internet allowing you to access thousands of patterns and stitches. Computerized machines can be beneficial to sewers who are heavily into quilting designs and intricate embroidery. A more expensive machine doesn’t always mean it is better. There are many reliable machines that are great for beginners but don’t cost an arm and a leg. Sewing machines range in price from under $100 to thousands of dollars. Prices are determined by such things as the type of machine (see question 3), brand (see question 5), as well as features and accessories (see question 6). Think carefully about how much you want to spend, and stick to that amount. Don’t spend time looking at machines that are more than your budgeted amount. Keep in mind, the machine won’t be your only cost as you begin your sewing journey. 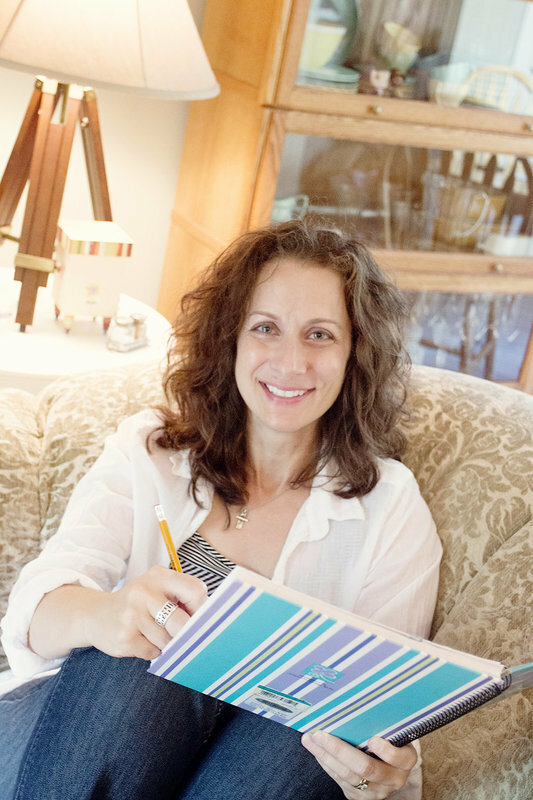 If you budget your finances, in addition to the sewing machine, there are some tools you will need as well as notions and fabric for the projects you want to do. Is having a brand name sewing machine important? When you buy your sewing machine, more than likely it will come with some accessories (like presser feet, bobbins, needles, etc.). Some of these accessories can be universal and fit on a variety of different sewing machines. Other accessories will be specific to the brand and model of your machine. If you buy a well-known brand of sewing machine, it will be easier to find accessories when you need them. What features are “must-haves” for your sewing machine? Since 1995, I’ve sewn on the same basic mechanical machine. Nothing fancy to it. One feature I really like is the accessory box that serves as an extension plate when it is slid on the free arm. Recently, it stopped working in the middle of a project, so I borrowed a basic mechanical machine from my mom that she no longer uses. This machine was manufactured in 2005. It has some convenient features my old faithful machine doesn’t, like a needle threader, a thread cutter that is attached to the machine, and a way to regulate the sewing speed. My mom is a quilter and is constantly creating quilt tops. She has several electronic sewing machines she uses and they have some pretty neat features that for her are “must-haves”: an automatic thread cutter, a light that tells you when the bobbin is almost empty, and an automatic needle up and down when you start and stop. Regardless of the type, brand, or price of your machine, there will be some features and possibly some advanced options that intrigue you. Think carefully about what you must have on your machine. 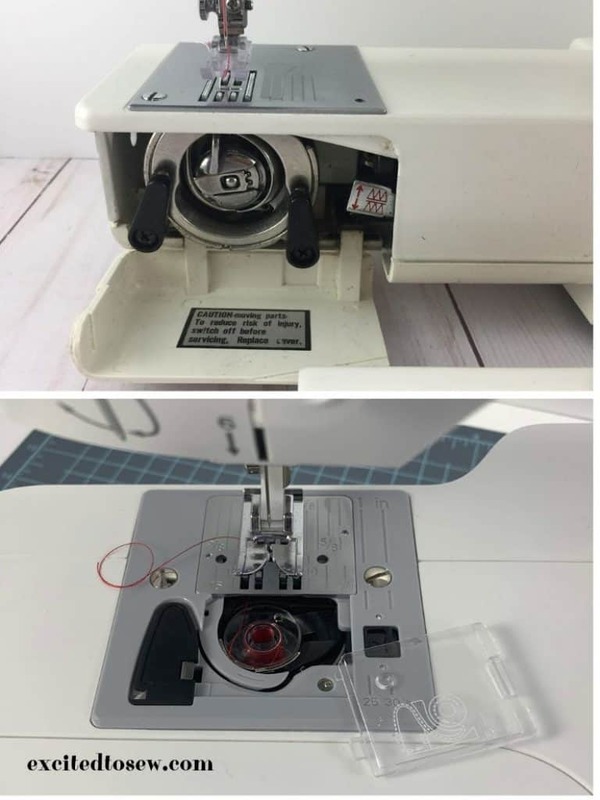 Keep in mind, for your first machine you want one that will allow you to focus on your sewing skills instead of a machine that has a bunch of features you may never use. Does the machine have a free arm? When a sewing machine has a free arm it is easier to sew sleeves, pant legs, or other items that are difficult to sew on a flat area. 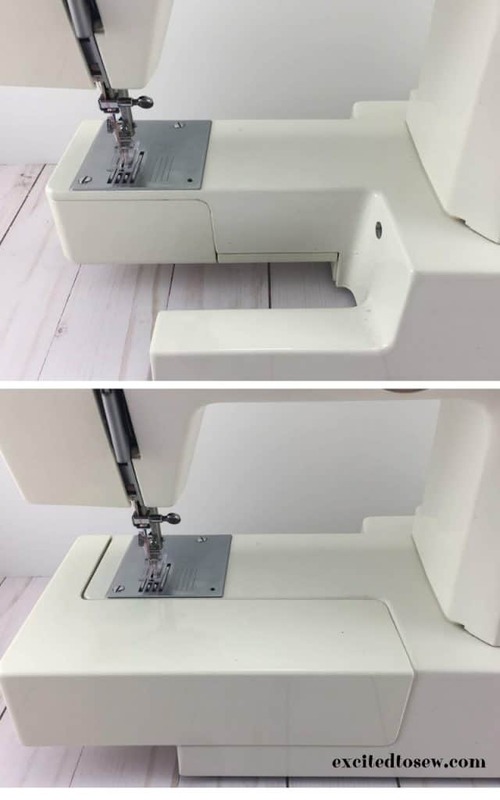 If you will be sewing clothes or doing projects that may have a tube shape (like bags, purses, or waistbands), you want the sewing machine to have a free arm. On some sewing machines, you can access the free arm by removing the accessory box or extension plate. In my opinion, you want to make sure the machine you purchase has a free arm. Top picture: Free arm is exposed. Bottom picture: Free arm and accessory box make a larger sewing area. Does the bobbin load from the front or the top of the machine? Front-loading bobbins have been around for a long time. This type of bobbin is placed in a case before being inserted in the sewing machine. Often times, the bobbin house is located behind the accessory box which has to be moved before the bobbin can be changed. Top picture: Front loading bobbin. Bottom picture: Top loading bobbin. Top-loading bobbins have been around for a while and are a more recent design feature. This type of bobbin doesn’t require a separate case. Usually, the bobbin house is easy to access because it is on the top of the machine, right in front of the needle plate. Some top-loading bobbins have a transparent cover allowing you to see when the bobbin is almost empty. Most modern machines have top-loading bobbins. However, there are still a few machines that have front-loading bobbins. Many sewers have a preference of one over the other. If you have the opportunity to work with different machines before you make a final decision, try inserting the bobbin into both a front-loading and top-loading machine and see if you like one better than the other. Where is the spool pin? The spool pin is the shaft that holds the spool of thread in place on the machine. Usually located on the top of the machine, it can be vertical (standing up) or horizontal (laying down). Some machines have a diagonal spool pin on the top of the machine. Top picture: Horizontal spool pin and an attachment for a vertical one. Bottom left: Horizontal spool pin. Bottom right: Vertical spool pin. Also, some sewing machines with a horizontal spool pin have a hole where a second spool pin can be inserted on top of the machine. This additional spool pin may be included with the machine or may need to be purchased separately. I never really paid attention to the direction of the spool pin until I borrowed my mother’s machine. My sewing machine had a vertical spool pin. I could easily see the spool of thread and knew when the spool was almost empty. When my sewing machine stopped working, I borrowed a machine from my mother. It has a horizontal spool pin. I was quilting a lap quilt and the project required a lot of thread. I had gone through several bobbins and knew the spool of thread would be running out soon. While I sewed I could not easily see the spool of thread because the horizontal pin nestled in a space at the top of the machine. I couldn’t just glance up and see how much thread was left. It was necessary to sit very straight and stretch my neck to see how much thread was left on the spool. An advantage of a horizontal spool pin is if you need to move the machine you can leave the machine threaded and the spool in place if the handle has hinges to use the hande and lift the machine. If you have a vertical spool pin, more than likely you will need to remove the thread and push the pin down in order to access the handle to carry the machine. What type of stitches and presser feet does the machine have? The straight stitch and zigzag stitch are two stitches you definitely must have on your sewing machine. These two stitches will allow you to accomplish almost all of your sewing projects. If your machine has the straight and zigzag stitches, it should also have the option for you to adjust both the length and width of the stitches. I have never seen a machine where you couldn’t make these two adjustments, but that doesn’t mean that machine isn’t out there…make sure these are options on the machine you buy. Some specialty stitches require a specific presser foot. Find out what presser feet are included if your machine has multiple stitches. You may need to purchase them separately. By answering the ten questions above, you will be in a position to know what you want and what you don’t want in a sewing machine. This knowledge will give you an advantage when shopping for a sewing machine. You will be able to narrow your focus to only those machines that meet your criteria. As a result, you will know exactly what you are looking for and be less overwhelmed by all the choices. You will have fun looking for the perfect sewing machine for you. In the end, the sewing machine you decide on will fit your purpose, your budget, and make your sewing experiences enjoyable. Now, it is time to decide where to buy your sewing machine!